The magician borrows a ring from anyone in the audience. Performer comments that it's a nice ring and wants a better and closer look. Going over to his table he turns on a small table lamp to help give him more light to see the ring. Performer offers to polish the ring and takes a polishing cloth and shines it up a bit. The ring is then left in the middle of the cloth and given to the spectator to hold. For those magicians who think they are already a step ahead, please note that all 4 corner of the polishing cloth are hanging down and can be seen. Performer picks up a small box and shows it empty. He states the ring will fly from the spectator's hand and magically appear in the empty box. 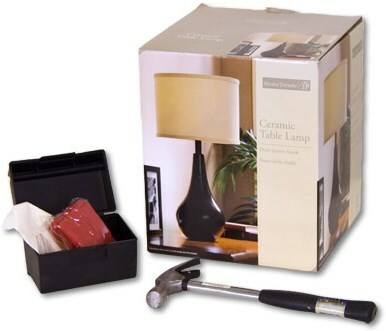 The box is placed on the table next to the lamp. Performer snatches the cloth and shakes it. The ring has vanished. At that very moment--the lamp on the table GOES OUT! Magician doesn't see this as his back is to the lamp but the audience sees it go out. He then goes over and proudly opens the box to show the ring inside. What??? The box is empty! Something must have gone wrong. Just then the magician notices the lamp has gone out. He says, "Oh no, this has happened before." Casually showing both hands empty he goes over and shakes the lamp--a rattle is heard coming from the bulb. Magician unscrews the bulb, and very cleanly allows it to be seen his hands are empty. Magician says he will break the bulb open and see what's inside. He shows a small napkin EMPTY and wraps the bulb in it to protect the audience from flying glass. One last time while the bulb is wrapped in the napkin, he shakes it so they can hear something inside the bulb. Taking a hammer, the bulb is partially broken, leaving most of it intact. The partially broken bulb is removed from the napkin and shown to the spectator. They can see their ring INSIDE THE BULB! Taking a pair of tweezers he carefully removes the borrowed ring from the broken bulb and returns it unharmed to the spectator. One Man Effect...no assistant needed. Light goes out the moment the ring vanishes. 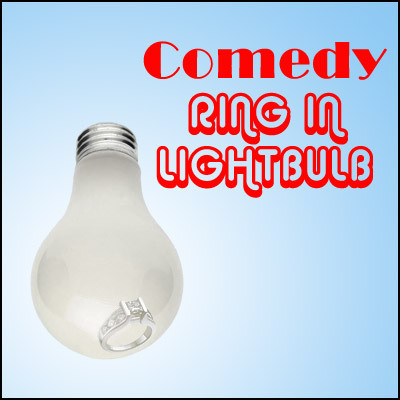 Ring is heard to rattle inside the bulb while in the lamp and after it is removed. No rattle devices hidden on the body. When the bulb is shaken, the noise they hear inside is the borrowed ring. FOR REAL! Also includes a bonus routine where the ring is cleaned via heat. The paper burst into flames, the ring vanishes and is found inside the lamp. Makes a great follow up effect to the Paint Surprise ring effect. Comes complete with special table lamp, special polishing cloth, tweezers, napkins, small box, hammer, and all needed gimmicks.